The diary shows hirer organised activities, as well as church activities, services and meetings. Scroll down to view more days. Activites are at our church site in Joel Street, unless otherwise stated. Activity times on the diary may be times the hirer has booked the room, please check sessions times & details with the activity organiser. Calendar times are only given to the nearest hour/half-hour. We try to ensure details are up-to-date but cannot guarantee things won't change! ​If you notice anything that needs changing, please contact the Church Office Manager see ​Contact page). Sunday 14th April 10.30am Palm Sunday Church Service. Thursday 18th April 8pm Maundy Thursday Supper and Communion Service at St. John’s URC, Northwood. Friday 19th April 10.30am Good Friday Service led by the Worship Group. St. John’s URC will join us. Saturday 20th April - NO Coffee morning today! Thursday 2nd May - NO Sandwich Service today. No Come & Sing Group Friday practice meetings from 19th April to 3rd May inclusive. Saturday 11th May at 3pm - Concert by Steve Lethbridge and KAOS. We look forward to another wonderful musical afternoon. Details to follow. Christian Aid Week 12th - 18th May starting with the Super Soup Lunch on Sunday 12th May (details to follow). Saturday 18th May - In Field End Road, outside the shops, 10am-3pm. These will be one-hour slots. Your help and support will be greatly appreciated. If you can help please see Liz N.
If you live or work locally to us and would like to share your views on our future development - see our questionnaire here. More background in our Minister's recent article from the Northwood Hills Echo. Foodbank: Our Foodbank Distribution Centre would particularly welcome donations of: tinned meat, tinned fish, tea, instant coffee, long life milk, hair shampoo, toothpaste, shower gel and deodorants. Thank you! CTE Service and Annual General Meeting will be held at our church on 30th June from 4pm to approximately 5.30pm. In January our Homelessness Sunday Hotpot Lunch raised £257 for Trinity, our local homeless charity. 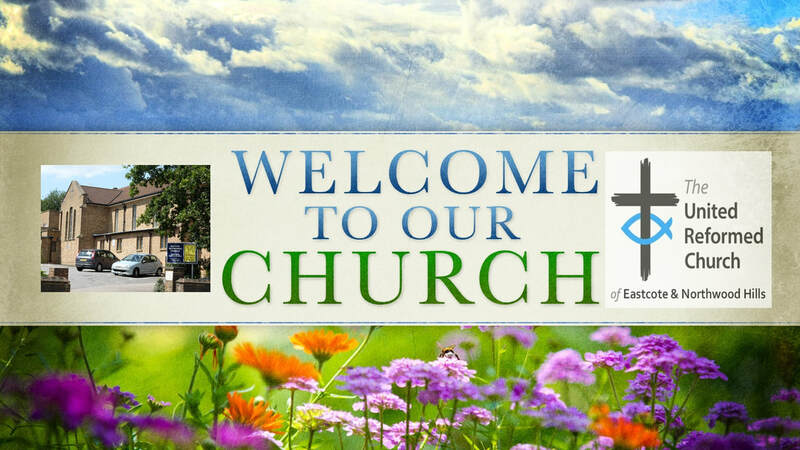 We are a small but growing United Reformed Church based in Northwood Hills also serving Eastcote and surrounding areas. ​Our Minister is the Revd. Liz Shaw. We are progressive and non-conformist in our theology and aim to be an inclusive and outward looking community. We embrace diversity, and welcome people regardless of ethnicity, sexuality, gender, or social standing. ​We are active in social justice and believe the Gospel calls us to act on issues of politics, justice and peace. a short service (20 minutes) followed by a free light sandwich lunch. Special services at other times of the year including Christmas, Lent, Easter, Pentecost and Harvest. ​See our Church & Worship pages for more information. More about our history on our History page. We serve our local community, with a variety of church arranged activities including a book circle and singing group. ​We also support the work of the Dementia Cafe, CMSS Skills Development Centre, and Northwood Live at Home Friendship Group. Community organisations and groups hire our rooms and run a variety of activities throughout the week. See our Community pages for more information. ​See our Facilities page for details on hiring facilities. ​1st & 3rd Saturdays of a month 10.30am - 12 noon. ​​See more on our Faith in Action pages. Several rooms or the kitchen may be hired for appropriate private functions and activities or to regular groups when not being used by Church groups. ​See the Diary above for information on current activities/hirers. For contact names & details and travel directions see our ​Contact page.